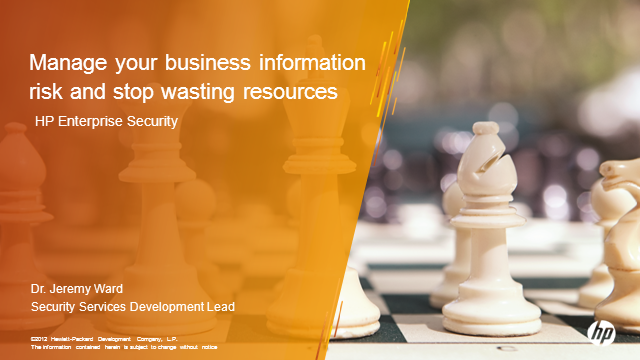 This webinar will discuss how effective management of the risk to business information will enable your organization to achieve the right balance between information security and operational efficiency. It will look at the sources of information risk and how these affect business; and will consider the issues that many organizations face as a result of taking a tactical, rather than strategic approach to dealing with them. It will look at how resources are currently allocated and at the consequences of this for information risk management. It will show how an approach can be taken to establish a direct link between critical information assets and business objectives and thus gain Board-level understanding of business information risk. Finally, it will show the importance of communicating this understanding and of the controls that flow from it throughout the organization; to create a "community of purpose" in the management of business information risk.